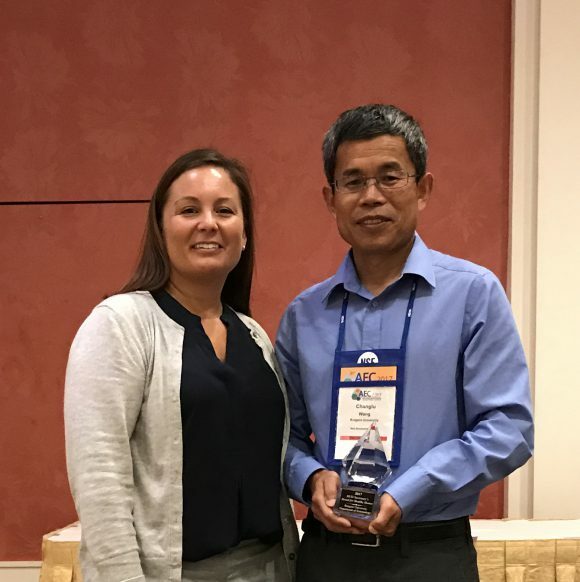 Share the post "Changlu Wang’s Urban Entomology Program Earns HUD Secretary’s 2017 Healthy Homes Award"
Michelle Miller, Deputy Director, Office of Lead Hazard Control and Healthy Homes, presented the HUD Secretary’s Award for Healthy Homes to Changlu Wang. 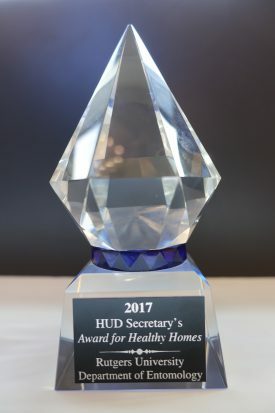 The U.S. Department of Housing and Urban Development (HUD) and the National Environmental Health Association (NEHA) announced that Rutgers Urban Entomology program is one of four model programs around the nation that are recipients of the HUD Secretary’s Award for Healthy Homes, an award recognizing excellence in making indoor environments healthier through healthy homes. For the third consecutive year, HUD and NEHA identified outstanding local programs that promote healthier housing through research, education or innovated practices. HUD and NEHA selected the Rutgers University Bed Bug Monitoring Protocol and Model Integrated Pest Management Program as a recipient, along with Denver Housing Authority’s South Lincoln Neighborhood Redevelopment Mariposa project; Vermont Weatherization’s One Touch Program; and Tribal Healthy Homes Network’s Partnership for Air Matters in Alaska. The awards were presented at NEHA’s 2017 Annual Educational Conference and Exhibition in Grand Rapids, Michigan on July 12. Under the leadership of Wang, the Urban Entomology Lab in the Department of Entomology at the School of Environmental and Biological Sciences, cooperated with low-income communities, manufacturers, and other universities in developing and improving the adoption of effective Integrated Pest Management programs. The team has helped seven low-income communities to monitor and control bed bugs during the past eight years. They also helped five communities with cockroach management. These studies resulted in patents, technology transfer, novel pest control products, and numerous publications in refereed and non-refereed journals. Cockroaches contaminate food and produce allergens that are asthma triggers. At least 10 allergens have been isolated from the German cockroaches. High cockroach populations lead to high allergen levels. Bed bug infestations have both significant medical and economic impacts. Bed bug bites cause pain, itchiness, loss of sleep, and psychological distress to humans. The cost for controlling bed bug infestations is a serious financial burden to low-income communities, with the typical cost for treating a one-bedroom apartment is approximately $450. The Northeast region of the U.S. is especially vulnerable to high prevalence of cockroach and bed infestations due to high population density and presence of many public housing developments. Public housing are often located in low-income, minority neighborhoods. Due to financial limitations and poor pest control services provided to these communities, they typically have persistent pest infestations. There are wide concerns over high prevalence of pest infestations, high cockroach allergens levels, and frequent insecticide applications in homes. In 2013, the team was awarded a HUD grant for a study titled, “Implementation and Evaluation of a Model Bed Bug Management Program in Low-Income Housing.” The study, which concluded in 2016, partnered with three New Jersey housing authorities responsible for more than 2,000 apartments, and involved the design and implementation of a low-cost and highly effective bed bug monitoring protocol and a model IPM program. This protocol was published in a peer-reviewed publication, Journal of Medical Entomology, 53 (3): 639-646. The article, “Bed Bugs: Prevalence in Low-Income Communities, Resident’s Reactions, and Implementation of a Low-Cost Inspection Protocol,” was authored by Changlu Wang, Narinderpal Singh, Chen Zha, Richard Cooper.